Ranging from sleek modern fires to more classical designs, our big range of inset electric fires includes high-quality brands like Gazco, Dimplex and Eko at the best prices you’ll find in Leicester and the East Midlands. 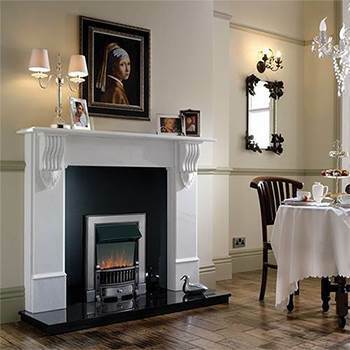 As well as standard hearth insets and free-standing units, we also offer a selection of wall inset electric fires, that are designed to be mounted in a recess on the wall. Explore our range of inset electric fires, each available with a choice of finishes and fuel-bed options so you’re sure to find something that’s right for your home. Call 0116 274 4057 to speak to our friendly product advisors, or why not pay a visit to our large showroom in Leicester, where you can see our range of electric inset fires up close.